[3.6] - Summon Phantasm on Kill buffed to trigger 10% on hit vs rare and unique enemies. No other changes. [3.5] - Heralds of Agony and Purity now only scale physical damage, not all damage. This is a nerf to builds that were using sources of flat non-physical damage to minions (eg. abyssal jewels). As we don't do that, there's no change to the build. Note, Agony Crawler's damage is physical with chaos conversion, so this doesn't impact it. Do you want to play a spicy new build which has the following? Then this is the build for you!! Credit for the original build concept goes to sViin, who's build is the inspiration for this one. The below were captured in 3.4 delve league! 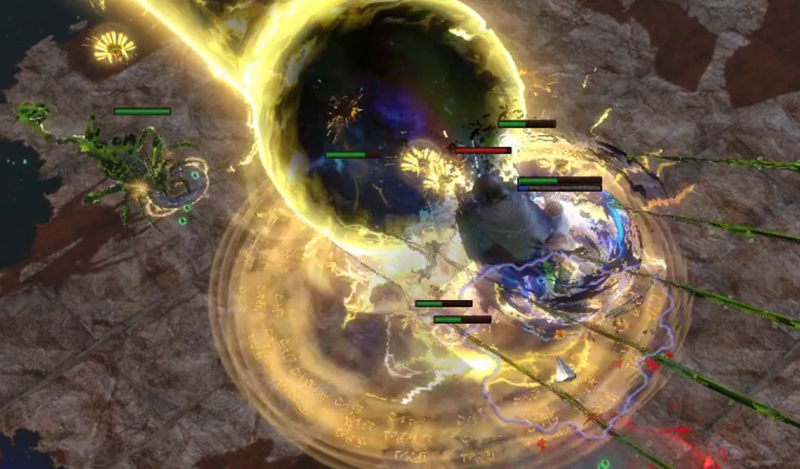 Playlist: all Cyclone Summoner videos! Shaper kill: level 82, made some mistakes and died a couple of times, should have been deathless. Chimera kill: level 82, Chimera itself is a bit slow because double life mods, but overall smooth map and kill. T14 Crimson Temple with chain: level 82, this build's minions are untargetable (as far as I can see) with the exception of Sentinels of Purity which you mostly get on bosses! As such, it seems as though chain doesn't do a thing. Darkness tanking: level 75, demonstration of how insane life gain on hit is in Delves and this build is one of the best around for it. If you don't yet use Path of Building (PoB), you should! PoB assists with build planning and optimisation. You can find more information and a download link here. Pantheon: Lunaris and Gruthkul for physical damage reduction. Level 90 Skill tree: HERE. The best way to get an idea for the build is to watch the videos above. - Simply pop your non-life flasks and Cyclone through packs - your minions will do the rest! - You can very easily face-tank high level bosses with this build (eg. I did a Minotaur at level 79 with under 5k hp facetanking). - The only somewhat annoying map mod for the build is physical reflect as your relics will one-shot themselves. To run this mod, just summon one relic at a time before entering each new pack. The relic and your agony crawler will mop up just fine. As I mentioned earlier, I spent around 2ex total on gear for this build around two weeks into the 3.4 Delve league. With this in mind, it's a very viable option for a league starter or budget build. Get the required items ASAP. Coming Calamity and Victario's Charity will be cheap in the first couple of days. If you cannot get a Geofri's Legacy (should also be pretty cheap, and assuming the prophecy doesn't change in 3.5 requires completion of a tier 3 map), you can use Geofri's Crest for good resists and +1 to socketed gems while looking out for "The Bishop's Legacy" prophecy (a good rare with life and resists is also great until Legacy). After this, look for 6L gloves and Minion Movement Speed (Fear) jewelry. Grab an Essence Worm and Elder life gain on hit claw when you can. Shield: Victario's Charity. Victario's is best in slot for this build as it gives our minions frenzy charges. Frenzy charges for minions are an insane damage boost. See HERE for more info on how charges effect minions. Helm: Geofri's Legacy. Legacy gives us the second Holy Relic which is our main clearing minion. Don't worry about the cooldown recovery speed mod, it's largely irrelevant, focus on getting resists here. Top enchants are % increased damage for Holy Relics or Agony Crawler - if you get one of these, you're lucky, but they're by no means required. Body Armour: The Coming Calamity. Coming Calamity is what allows us to run a 5-6 link Herald of Agony and 4 link Herald of Purity. This item is build enabling and a must-have. Don't worry about getting 6 links, 5 is plenty to take down Shaper. Gloves: Elder gloves with supported by Poison and Faster attacks. These gloves allow us to run our preferred 6 link Cyclone setup. Until you can get them use a nice rare with life and resists. Prioritise life and resists as secondary affixes in your Elder gloves. Boots: Good rare with movement speed (25%+), life and resists. Getting some Dex here can be nice too. Belt: Good rare Stygian Vise with life and resists. It's important to get a Stygian Vise here to socket our Abyssal Jewel. Until you get the Jewel, use a Leather Belt. Jewelry: Essence Worm gives us Hatred (it's free reservation and there's no downside because Coming Calamity overrides the total values of our heralds). The other ring and amulet should be good rares with life and resists. Ideally, you will also have "Minions have % increased movement speed" on your rare jewelry. These can be crafted with Essences of Fear (Screaming or higher recommended), or simply buy them. Jewels: 1x Abyssal Jewel with two affixes: minions have chance to blind and chance to taunt on hit. This helps with your survivability and life gain on his with blind. Socket this in your Stygian Vise. If you can only get one mod, go with taunt then work up to the double mod. 4x jewels with 5% chance to poison on hit, life and attack speed (global/with shield/with claw/etc). These are important to get 100% chance to poison on cyclone, but not so critical to get immediately. Work up to these as you get the jewel sockets on tree. 1x Good rare jewel with life and whatever other stats you need (attributes, resists, attack speed, etc). Flasks: Seething Divine Life, Quicksilver, Silver, Basalt, Quartz. Be sure to get Staunching, Warding and Heat at a minimum. Energy Shield on hit Watcher's Eye - Drop your Essence Worm aura for Discipline and get an extra 20% effective health gained on hit. This helps a lot for tankiness/survivability. This also works for Vitlity and LGoH Watcher's eye. Discipline is better though if you can afford the jewel. Rare elder helm with +2/3 to socketed minion gems and supported by Minion Damage to socket Herald of Purity-Maim-Melee Physical Damage-Ruthless/Empower(level 3+) - This setup is useful against bosses who deal large area damage and kill your Holy Relics. Relics generally are good, but not stellar against bosses like Shaper and you often need to resummon them, so having only one (socketed in boots) and stronger Herald of Purity minions suits if you're going to be chaining t16+ bosses. Note, if you use Ruthless you'll want to drop Hatred for Haste or the Discipline + watcher's eye setup. Gems and options can be found in the PoB. See below for detailed gem descriptions. Gems are listed in priority order. This is the core 4L after which you have the following options based on preference. These three setups are your main sources of damage. Feel free to customise your Herald of Agony setup to the content you're going and personal preference. If you want to use Cyclone before having the double "supported by" gloves, use Cyclone-Faster Attacks-Poison-Fortify/Life Gain on Hit. Additionally, you can get only a single "supported by" gloves and not use blind if you don't have the life gained on hit vs blinded enemies elder claw yet. Cyclone is how we trigger our minions and sustain life and mana. Movement for when you're not Cycloning. Blood Magic is really nice as it means you'll always be able to attack and gain mana back (even in no-regen maps). Hatred = more hit damage, Haste = increased attacks = higher life gained on hit and minion attack speed - personal preference on this one (I like Hatred). Some nice movement utility you can throw into the 6th socket of a 5L Coming Calamity - not essential. Guardian Ascendancy priority: Radiant Crusade-Unwavering Crusade-Bastion of Hope-Harmony of Purpose. The skill tree in this build suits itself well to leveling as almost anything. Simply come out of Templar's start along any track you wish, then travel up to Spiritual Command and Spiritual Aid. This will give you enough damage and attack speed to scale any skill. Switching to the build is pretty flexible based on the gear you have available. Be sure to have the following at a minimum once you've switched (after the respec). If leveling this build at league start I recommend one of the following four options (trees are in the PoB!). Finish the PoB numbered trees then work towards the level 90 tree taking the above required nodes and life. Be sure your lootfilter includes Double Claws (at least normal, but there's some value in highlighting and identifying magic too). Use Freezing Pulse until you have access to Arc, then Arc with Added Lightning Damage and Controlled Destruction in a +1 lightning gems wand or sceptre. Once you get a 4L BBBR and Ancestral Bond Cluster (take only after you have the 4L) you can use Arc-Spell Totem-Faster Casting-Controlled Destruction. Ascend to Hierophant and take Pursuit of Faith at normal lab. You can continue taking points in Hierophant if you don't want to switch by cruel lab by taking Ritual of Awakening, but it's by no means required. Use Smite-Ancestral Call-Melee Physical Damage until Dominating Blow-Melee Physical Damage-Minion Damage-Melee Splash. Also use Herald of Purity-Melee Physical Damage-Maim-Minion Damage. The Gladiator version of the build is much more defensive (and much more expensive). You lose a bit of damage, but thanks to Gladiator's block nodes and some spicy gear you can end up with 82% chance to block attacks and spells at all times. This on top of 6.5–7k life and the massive amount of life gain on hit the build gets makes you practically unkillable, and the damage is still high enough to comfortably clear with relics and kill bosses quickly with Crawler and Sentinels. By far the tankiest build I've ever played, and it honestly does not feel balanced. Also, you get to play a Gladiator summoner! How could you not love anything that ridiculous? Leveling is a bit clunky. You can use Sunder or another random melee skill of choice until ~60, then swap into the build properly. Take some melee damage nodes when doing this and spec out of them later. I also do not recommend doing this as a starter build. It's too expensive. Do the Guardian version if you want to league start with this. Occultist's Profane Bloom and Vile Bastion both trigger from minion kills which makes Occultist a great option for an energy shield-based build of Cyclone Summoner! The below PoBs are concepts - to my knowledge they haven't been made in-game yet, but I think they have great potential. The mana reservations are pretty tight on these builds, so please put time in theorycrafting if you want to change them. Any unused sockets can be used for utility setups of your choice. I would not recommend starting a league with the Occultist options unless you plan a tree to start as life or hybrid then transition to CI and/or LL as the items are simply too expensive/rare to rely on having access to for your first character. If you make one of these build options, please post a reply with a link to your character or PoB with your progress (or PM me)! This guide is a work in progress. Please comment any questions you may have! I'm looking forward to your updated/complete guide today. At level 77, this build chews through virtually everything and anything I can throw at it. Great damage and survivability! Delves are a complete joke. Thanks for the awesome and unique build! Hey, I'm glad you're enjoying the build so far - how cool is it getting to use a bunch of new stuff in weird ways! Unfortunately, my net was down for more than 24h over the weekend, so I wasn't able to completely finish the guide - I'll polish it up over the next day or so. Totally get what you're saying about Delves - check out the video I posted above where I get up to 680 darkness stacks before getting 1 shot by a rare.